This section of our web site is intended to provide new NTS clients with sufficient information to ensure that initial test sessions are productive. We’ll discuss what equipment to bring to the tests, how to configure your system, and provide you with an overview of immunity testing criteria. Note: Always check with your program manager prior to your testing, depending upon the testing to be conducted, items on this checklist may be different. You should try to arrive for a test with everything you need to operate your Equipment Under Test (EUT), e.g., cables, peripherals, 48V DC power supplies (if required), host computers, special software (tested), etc., so your test time will not be lost searching for needed items. All I/O ports used in a typical application must have a cable connected. Ports that can be connected by the user to cables longer than 3 meters (10′), must be provided with at least a 3 meter cable for some tests. For best results, we suggest you use only high quality cables, and please bring spare cables of each cable type. At least one of each interface type must be connected to a typical peripheral. Other ports of a similar type should also be provided with I/O cables; the termination of the cable is left to your discretion. Though not a requirement, we suggest you use different peripherals. In the case of mutually exclusive ports, the “worst case” configuration with respect to EMI should be chosen. If this configuration cannot easily be determined, we’ll need to perform separate tests for each configuration. For different I/O protocols (such as USB, Firewire, RS232, or parallel), please bring separate (and different type) peripherals. If your EUT has more than one operating mode, for example: (1) a video adapter card that can operate at multiple resolutions and refresh rates, or (2) a network adapter card that can operate at 100 Mb/s or 1000 Mb/s, or (3) different configurations of a single device (that can connect to either a serial or parallel device, but not both simultaneously), it may be necessary to test your EUT in different modes and configurations to determine the worst case operating condition. During testing, your EUT should operate so that all functions and peripherals are fully exercised. Your EUT (or the support equipment that provides power), should be set to operate at the nominal operating voltage for the intended market (e.g. Europe 230V/50Hz, US & Canada 120V/60Hz, Australia 240V/50Hz, and Japan 100V/50Hz). If your EUT is powered from an AC-DC adapter, the adapter must be capable of operating at each required voltage (this may require more than one adapter). NTS uses generic NEMA 5-15 (15A) and NEMA 5-20 (20A) 3-pin, US, AC outlets for both 230V/50Hz and 120V/60Hz AC. For multi-phase units, NTS uses NEMA L21-30, 5-pin outlets. Adapters to convert to a variety of other outlets are available. However, we recommend that you call ahead to ensure the proper adapters will be at your test site when required. If your equipment has special requirements (such as water or compressed air), or if your equipment draws more than 12 Amps per phase at 230V, please advise your Project Manager. This will allow us to reserve the required equipment in advance of your arrival. Please prepare a test plan (in advance) and send a copy to NTS to avoid potential configuration problems. The test plan should include the tests and test levels required; it should reference the basic standards and describe the configuration(s) to be tested; it should detail the performance criteria that will be applied for each of the immunity tests. If a test plan is not available, you may be asked to complete a test plan prior to commencing the test. 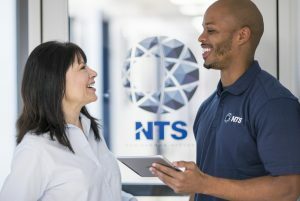 NTS can prepare your test documentation more quickly if you bring the configuration details and serial numbers of your equipment. Please include a block diagram or schematic showing the cable connections between units, the I/O port names, the support equipment, and cable lengths and types. Please list your EUT’s oscillator and clock frequencies (this will speed up testing and assist with any debugging). Please include this information in your test plan. Please be sure your software and hardware are sufficiently reliable to operate continuously for 6 hours or more. Please allow for the time it will take you to set up and tear down your equipment during your test session. You must be escorted into the secured test sites; the sites are open only during the scheduled test time. For Class B tests, all local support equipment must be rated class B. This can be determined from the equipment labeling which should show either an FCC ID number or a DoC Label with the FCC logo and the statement “tested to comply…” For Class A certifications, local support equipment may be either Class B or Class A. The complete system (EUT and local support equipment) must meet the emissions requirements. If this is your first test, we recommend pre-screening the support equipment to ensure it meets the relevant limits prior to performing a final test. If your EUT is a PC peripheral, your test configuration must include a PC with a keyboard, a display, and at least two local peripherals (not including a mouse or a joystick), and be connected to two different types of interface protocols. The keyboard and display may form part of the PC (e.g. laptop computer). The PC should run a program that exercises the peripherals and sends a scrolling “H” pattern (full screen) to the display. A second peripheral, such as a USB or RS232 device, must also be provided. If your EUT uses or generates signals in excess of 108 MHz, even if the signal is contained within an IC, emissions tests must be performed above 1 GHz for FCC Part 15 tests. If so, please inform your Project Manager beforehand so sufficient time can be reserved and the appropriate test equipment made available. During emissions testing, if you intend to remotely locate your support equipment from the EUT, you should bring at least 30 m (100′) cables to ensure the remote support equipment will have minimal effect on the measurements. Note: NTS may cut your shielded cables to perform conducted immunity tests. Please contact your Project Manager in advance of any immunity testing to discuss the use of shielded cables. During immunity testing, if you intend to remotely locate your support equipment from the EUT, please bring at least 25′ (7.6 meter) cables. During immunity testing, your EUT should be exercised so any degradation in performance may easily be observed. For example, this might include the visual monitoring of displays or LEDs or the use of audio analyzers or bit error rate testers. You should carefully consider what would constitute a failure for a particular test and how this would be monitored. Please refer to the “Examples of Immunity Criteria (A, B, C)” section for a description of common immunity tests and performance criteria. The following are generic examples of immunity test criteria found in some European product and generic immunity standards. These criteria are only examples of performance objectives for a specific test; specific criteria must be established for each product. Different performance criteria are allowed for different immunity tests. The interpretation of each criterion is based upon what the user should expect from the product during typical operation. Criterion A – Your EUT continues to operate as intended. No degradation of performance is allowed below the performance level specified by the manufacturer. Any degradation in performance should be transparent to the end-user. When testing Information Technology Equipment (ITE) Local Area Networks (LANs), it’s necessary to monitor the error rate, transmissions rate, loss of link, and requests for retry. Criterion B – Your EUT continues to operate as intended after the test with no performance degradation below the level specified by the manufacturer. During the test, some loss of performance is allowed but no loss of data or change in operating state is allowed. The end-user may notice the EUT has not performed correctly but should not have to do anything to cause it to resume its correct performance. There may be some exceptions (e.g., certain lab equipment should inform the user that an error has occurred requiring a repeat measurement). Criterion C – Temporary loss of function is allowed provided normal functioning is recoverable. The end-user may notice a system failure has occurred but should be able to restore the EUT to its correct operating conditions and performance level even if it requires power cycling or a reboot sequence. When performing immunity tests, it’s important the performance criteria and monitoring method are clearly defined. Your product should be fully exercised and all failures should be easily observed. 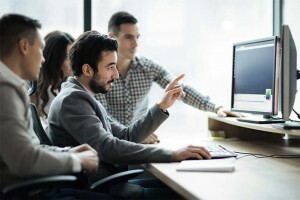 This may require the use of special software, with a halt-on-error routine for the tests that require Criterion A and a continue-on-error routine for Criterion B. This will give our test engineer a clear indication whether or not the EUT has met the required performance level. It’s preferable to have an objective set of metrics (such as Bit Error Rate, SINAD, etc. ), rather than a subjective metric (such as watching for the LED to stop flashing, or watching a monitor for distortion). Also, you can monitor your system’s performance with our video cameras and audio amplifiers.